The mission of Pulama ia Kona Heritage Preservation Council is to preserve, protect, and enhance the special qualities of historic Kona. Pulama ia Kona is beginning its 2014 campaign to create signs for almost 30 of the historic buildings along the ten mile Mamalahoa Kona Scenic Byway. 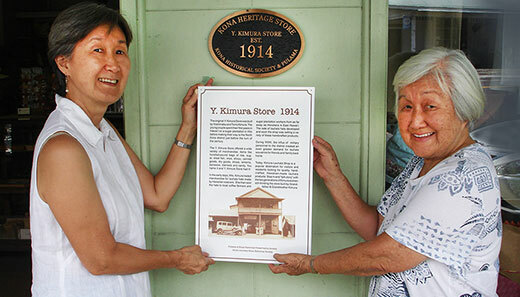 Pulama volunteers will research and interview building owners from the Komo Store to Keauhou Store to ensure accurate information is presented to residents and visitors. The 18” by 24” Sentra signs will feature old photos and information about the original buildings whenever possible and be UV coated for protection from the sun and weather. Signs will be designed, created and installed at no cost to the building owners.